How many times as a pathological gambler have you said, “I’ll stop – as soon as I recuperate my last loss?” This is a sure sign of a gambling problem, one that can be helped through the empowering process of hypnosis. Hypnosis taps into the strengths and abilities within you to help you overcome detrimental behaviors. 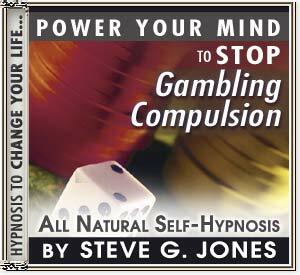 Clinical hypnotherapist, Dr. Steve G. Jones M.Ed., unleashes those abilities in his program, Ending Gambling Addiction by helping you relax so your inner ability to quit gambling has a more dominant role than the addictive behavior. Have you developed a 'system' that CAN'T LOSE? and they're waiting for you to come back. DO SOMETHING FOR YOURSELF TODAY...END THIS ADDICTION ONCE AND FOR ALL...BEFORE IT ENDS YOU !!!! !